Joyce was a firecracker! She was very passionate about her work and had been with the company for many years. Sometimes her enthusiasm could be perceived as complaining but it was hard to argue with her work ethic. One Monday I walked over to her desk to see how things were going because I had heard there was a pretty severe production problem over the weekend. That was a pretty common occurance and since Joyce had been there so long, she was always getting pulled into these problems. She had just finished a conversation with her boss. I could see her standing up behind her desk chair as I walked closer and could see she was using the chair to support herself. I asked her what was the matter and she said her back was a bit sore, I knew there was something more to it. I suggested it would be a good idea for her to go home, she didn’t look good and odds are somebody else can figure out what was happening with the production problem. She said she “had to stay” and wouldn’t be able to rest at home anyway so she was going to stay. I had later found out she had a bad reaction to some medication as a result of a back problem which was making her situation worse. I tried to convince her again to go home and offered to talk to her boss but she said she had told her boss she’s ok to stay long enough to help with this fix. At that point I started getting really upset…especially at her boss. How could anyone consider any work related problem to be more important than their own health and the health of their co-workers. I told her she always has a choice and health comes first. 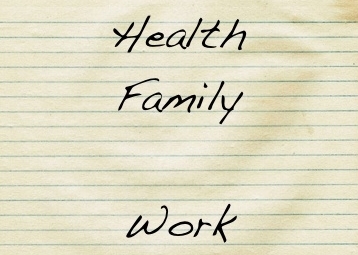 Without health you cannot take care of your family. That’s what matters and again I tried to persuade her to go home and that I’d talk to her boss, but she persisted, and I let it go. By this point I was absolutely furious at her boss, regardless if it was her boss that was pressuring her or not. Granted Joyce is partially responsible in the decision to stay, but I was fuming nonetheless. Since I was a consultant I decided to go home myself because I was in no mood to be in that environment at the time. I canceled all my meetings, went home and didn’t bill for the half-day I was there. I’m sure Joyce’s case is an extreme one, but I have seen time and time again where people value work as being more important than their own health. I’ve known many so called work-a-holics or heros that like to joke about “well, I’m going to be here ’till midnight anyway! ha ha ha…” and I will admit, I used to be one. Joyce helped me understand….really understand… what’s important. From that moment on I have been very attentive of work/life balance. Sure there’s the occasional long night, but it’s rare. When I leave the office at the end of the day, I leave the office physically and mentally. I’ve found people can be pulled so far into the status quo that daily drama can be like a drug. It’s often easier to respond to drama than to do something differently. Remember this, as Jerry Weinberg told us at PSL, it doesn’t need to be this way. I was recently put into a stressful situation at work. Fortunately the prectice nurse was going off duty, when she saw me in the car park after dealing with an incident. She recognised that things were not right, she stayed with me until I felt well enoguh to go into her surgery where she took my blood pressure. She found this to be very high and informed me that whe would have to call NHS24. They gave her advise and sent for an ambulance. The nurse (in her own time) accompanied me to hospital where I was monitored in hospital and gen an ECG. On leaving the hospital I was referred to my GP and the nurse again in her own time came to my home and took me, giving the docotor all the necessary information. I am now on blood pressure medication and my doctor gave me a sick note. However, the following day after the incident the Deputy Chief Executive of the organisation that I work for, asked to see the Practocie Nurse and told her in no undertain terms that she is there for the Young People in our care and NOT for staff. Although we are a Health Promoting Residential School promoting Heatlhy Working Lives. I am extremely grateful to the nurse and my GP was very impressed with her support.